The Meat Institute calls Beefshi a creative new culinary concept using prepared beef products including bologna, summer sausage, corned beef and pastrami as central sushi ingredients. March is National Deli Meat Month, and the D.C.-based North American Meat Institute wants to shine a light on Beefshi this month. 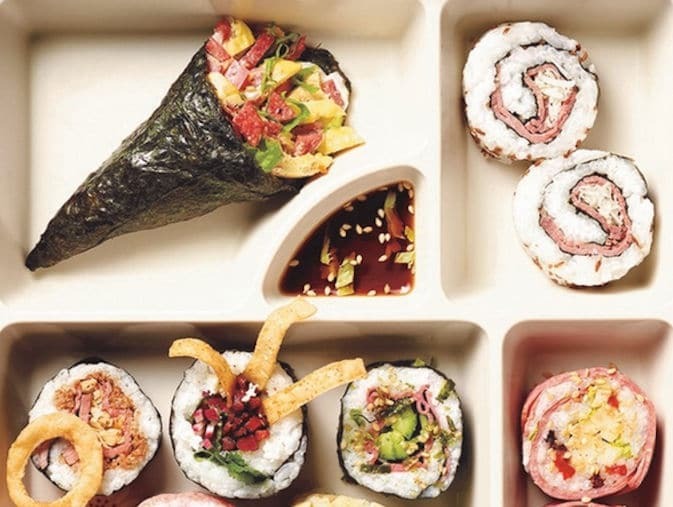 The Meat Institute calls Beefshi a creative new culinary concept using prepared beef products, including bologna, summer sausage, corned beef and pastrami as central sushi ingredients. Contrary to what many think, sushi does not mean raw seafood, though seafood — raw, smoked or otherwise, vegetables and just about any other ingredient can be used with the vinegared sushi rice. “Americans have always loved beef and, over the past few decades, their love of sushi has catapulted,” said Eric Mittenthal of the North American Meat Institute. “We couldn’t think of a better way to celebrate National Deli Meat Month than focusing on the marriage of beef and sushi,” he said. Sushi, in its many forms, has become one of the fastest growing categories in supermarket deli departments, according to Supermarket News. The Meat Institute has worked with a Culinary Institute of American trained chef to come up with eight Beefshi recipes, and posted the recipes online along with videos that show how to make them.